Magnus Maclean graduated from the University of Glasgow with an MA in 1886 and a DSc in 1895. He became the assistant of Lord Kelvin for many years before he was appointed as Lecturer on Electricity. He was also the first Celtic Lecturer in the University, from 1900-1903, and was later awarded LLD in 1919. Magnus Maclean was born 1st November 1857 on Skye and it was while helping with the harvest that he received the letter informing him that he had passed first class, with special distinction in mathematics, the entrance exam for Glasgow’s Free Church Training College. 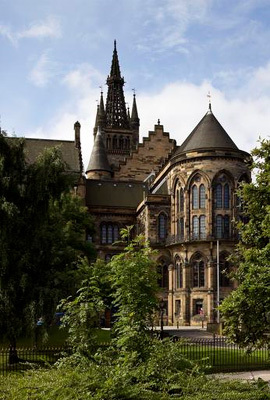 He entered the Training College in 1877 and also studied at the University of Glasgow for two years before teaching in a public school in Sutherland. Maclean re-entered the University of Glasgow in 1881, gaining the Lorimer bursary for mathematics. He was later appointed the Thomson Experimental Scholar in the Physical Laboratory and was the bursar of the London Highland Society. Before graduation from the University Maclean was already teaching his fellow students in the Natural Philosophy classroom and his clear aptitude attracted the attention of Lord Kelvin who chose him for an assistant. Magnus graduated with honours in Natural Philosophy and Mathematics and continued to work very closely with Lord Kelvin on many important experiments. He made himself very skilled in the use of Kelvin’s electrical measuring instruments. He gained the degree DSc in 1895 and was honoured with F.R.S.E (proposed by Lord Kelvin among others). He was appointed the Lecturer on Electricity at Glasgow before becoming the Professor of Electrical Engineering at the Royal Technical College in 1899. He held this post for almost 25 years and during his teaching published many volumes on the subject and submitted many papers to the Royal Societies of Edinburgh and London, the British Association and the Institute of Electrical Engineers. Upon his appointment to the Technical College, Lord Kelvin said that he did not believe it would be possible to find anyone better qualified for the position. As well as his great interest in science and mathematics, Magnus also held onto his roots in the Highlands. He was the first Celtic lecturer in the University of Glasgow and published his lectures in the volumes: ‘The Literature of the Highlands’ and ‘The Literature of the Celts’. He was president of the Gaelic Society and the Glasgow Skye Association. The Magnus Maclean Memorial Prize was founded in 1948 by a gift from the Glasgow Skye Association and is still awarded today, to the most distinguished student in Celtic Civilisation. He retired from his Chair in the Royal Technical College in 1924 and became an Emeritus professor. He died aged 80 on the 2nd September 1937.